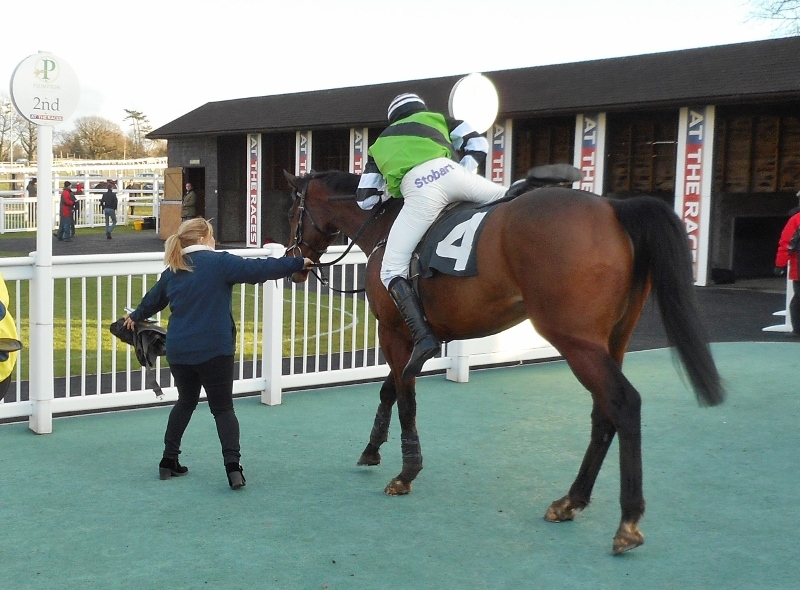 Clonusker showed that he was back to form when finishing 2nd in a conditional jockeys' handicap hurdle over 2 miles at Plumpton today. Ridden by Charlie Deutsch he led from the start at a sensible pace in the testing ground and, although shaken up towards the top of the hill on the first circuit, he maintained his position and was still in the van turning for home. 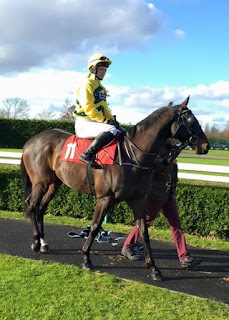 He had one serious challenger from two out who proved too strong approaching the last, leaving Clonusker to gallop on and hold second place, beaten two lengths. Into the unsaddling area reserved for the 2nd placed horse. 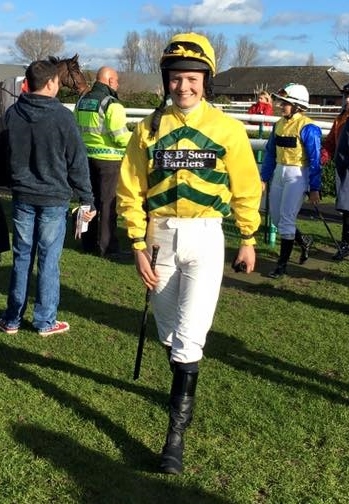 Frankie (stable hand at Linda's), having her first ever race ride, won the amateur riders' race on Claude Greenwood at Southwell this afternoon. Drawn in stall one, a good start was essential. He came out well but could not establish himself at the front, Frankie doing well not to get boxed in midfield before the turn. She settled for third place on the rail a couple of lengths behind the leader. The field had split in two by the middle of the back straight with Claude well up in the leading pack. Turning for home Frankie moved to the outside of the weakening leader, having judged the pace well, and Claude Greenwood eased into the lead. 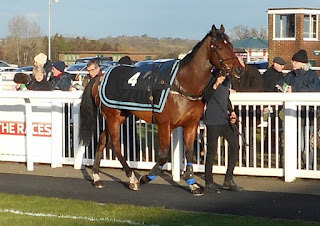 He continued galloping to the line, with Frankie just encouraging him and keeping him balanced, for what appeared to be a comfortable win by 2 and a quarter lengths. This victory keeps Linda as leading trainer at Southwell on strike rate. Frankie comes out for her first ride. Going out for the historic ride. 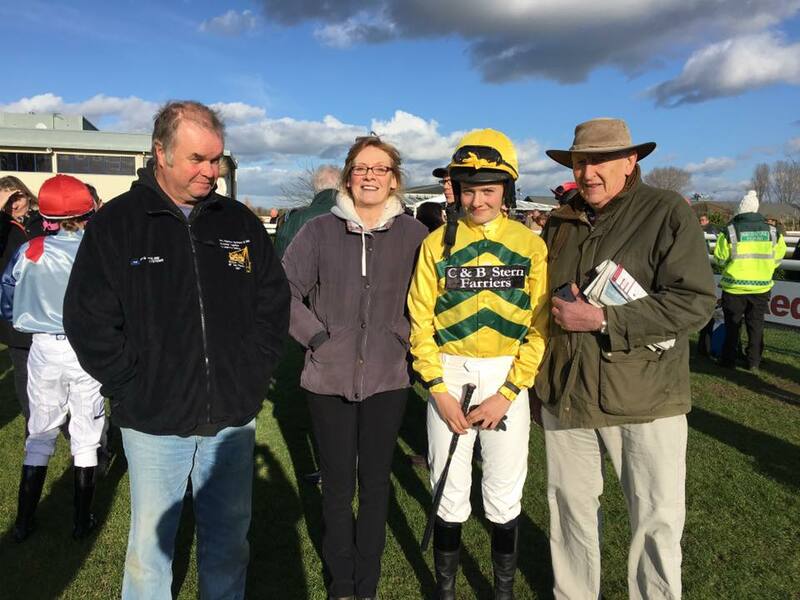 Fifi L’Amour made a pleasing comeback after a 250 day break, as Kayflin did last Monday, when she finished 3rd in a maiden handicap hurdle at Fakenham from 5 pounds out of the handicap. 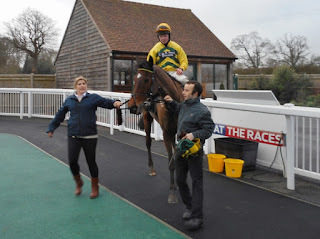 Under Brendan Powell she was jumped off at the front on the outside of another horse that wanted to be prominent. 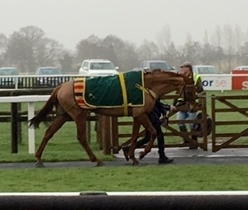 They set a good gallop in the blustery conditions and maintained their positions, creating a small gap to the third placed horse, until turning out of the back straight for the final time. Here the leader moved on as Fifi tried to keep pace. The favourite, who had looked beaten down the back, began to stay on and the three of them were all in contention rounding the turn for home. 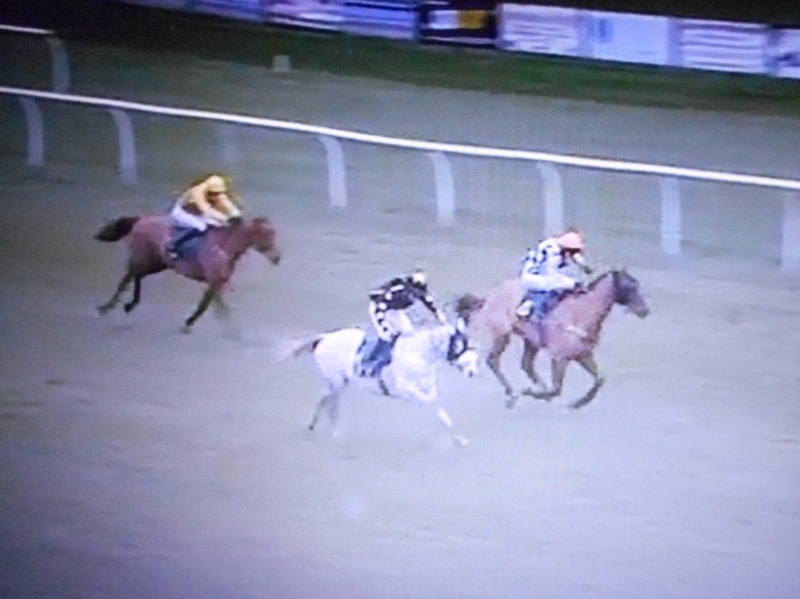 The favourite got up to win and Fifi finished third beaten a neck and 4 lengths. Fifi L'Amour (left) nearing the line. 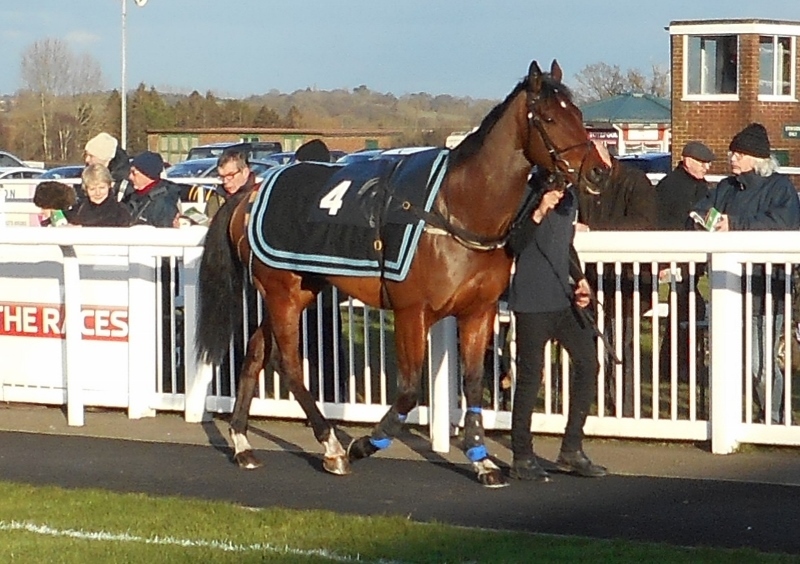 Kayflin made a return to racing, and a debut for Valence Racing, today at Plumpton and finished a very pleasing 2nd. She was the outsider of the field of 8 at 22/1. She was keen early, after her 204 day lay off, and Tom Garner had to hold her up near the back in the 2 mile contest. She was well in touch going out on the final circuit and Tom moved her up to the leaders down the hill. She was jumping well and there were only her and one other in contention rounding the bottom bend. The other horse pulled away but Kayflin stayed on up the hill in a clear second place, twelve lengths ahead of the third placed horse. Kayflin returns after finishing second.